We Proudly Serve the Entire Northwest! Advanced Radon Technologies is a world leader in the sub slab Diagnostic Testing. 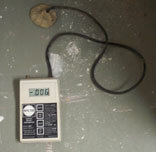 Diagnostic Testing is used to determine the air flow characteristics and pressure extension of a floor penetration. This is the first step in determining if the work conducted under the slab is sufficient and what is the appropriate fan for this application. ART has conducted thousands of these type of diagnostic tests form single family houses to 100,000 Sqft floor slabs. This allows ART to have a 99% success rate (100% in commercial) in reducing the radon levels to below the USEPA action level of 4 pCi/L. This diagnostic allows ART to install the most efficient radon system for the structure and design some of the larges and most complex radon systems installed anywhere in the world. Below is how ART conducts our diagnostic testing. Advanced Radon Technologies Inc. uses a core drill to create the excavation holes. 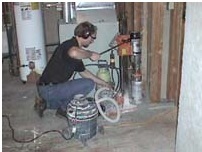 This device can drill a 1 ½" to 14" diameter hole through 14" of solid concrete. The time it takes us to complete a 5" diameter hole through 8" of concrete is less then 10 minutes. Our firm believes that this allows for a cleaner installation of the mitigation system. The removal of soil from the excavation hole can be the most time consuming portion of the mitigation process. 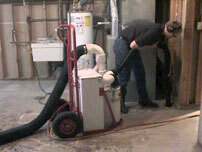 Most mitigation companies use a standard or heavy duty shop vacuum. Not ART, Inc., we designed and built the vacuum to increase the speed at which the soil can be removed. This vacuum has three (3) powerful motors drawing the soil into the detachable dump canister and exhausting the soil gases and the fine particulates, not trapped by the air filters, to the outside. 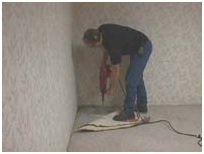 3/8" holes are drilled through the concrete floor in remote locations throughout the basement. The vacuum motor speed is gradually increased until communication with a micro manometer, is achieved. The tester indicates the static pressure and cfm required to mitigate the radon entering the structure. If the static pressure and cfm are within the capabilities of a radon mitigation fan, the installation of the piping begins. If the static pressure and cfm are not within these capabilities, the need for another penetration and additional excavation is required and the process described above is repeated. In the picture to the left we are reading a pressure change of 3 thousands. 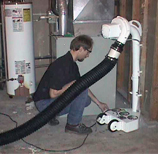 This device accurately simulates the airflow characteristics of a completed radon mitigation system. The instrument is placed over the 5" excavation hole from which typically 10 to 15 gallons of soil have been removed. 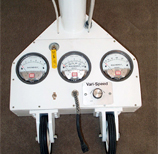 The vacuum motor with a variable speed drive; draws air past four (4) averaging total pressure and four (4) average static pressure probes which provide an accurate readout of air volume and static pressure on the instrument's 3 Magnehelic Differential Pressure Gauges. © Copyright 2019 Advanced Radon Tech. Tour Package by Rara Theme. Powered by WordPress .